Advantages: Packed with attractive profiles; many and varied colours and markings across all Seafire variants; detailed and useful captions describing ops, colours, markings and unusual features; specific references cited; great source of inspiration for modellers. The latest release in the Aviation Workshop Profiles series is The Supermarine Seafire in Fleet Air Arm and Worldwide Service, by Jon Freeman. 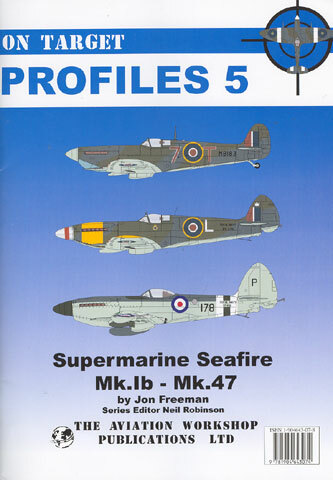 In common with earlier titles in the series, this book is crammed full of profiles of the subject - in this case 94 profiles of Seafires in all marks and in worldwide service. 22 of the aircraft are depicted in four-view diagrams on a full page. Jon Freeman's artwork will already be familiar to many of HyperScale's visitors, and his work here is clean, clear and very attractive. At 44 pages (plus covers), this title is slightly bigger than the earlier releases. This is partly due to wider coverage of the subject, but also because of the inclusion of more text. Each Seafire variant receives between a few paragraphs and a few pages worth of technical description and operational information. The captions are more detailed too, covering colours, markings, operations and references to photos. This is especially useful to modellers, as the artwork will provide the inspiration; but a photo will identify a myriad of minutiae. In my opinion, the extra captions, reference citations and descriptions in the Seafire book make a good formula even better. On Target Profiles 5 - Supermarine Seafire is a terrific title that will provide plenty of inspiration for modellers, and also specifically points the reader to more photos and information. The timing is excellent too, with the Grand Phoenix 1/48 scale "Ultimate" Seafire Mk.47 due for release soon, and most other Seafire variants available via either kit or conversion.